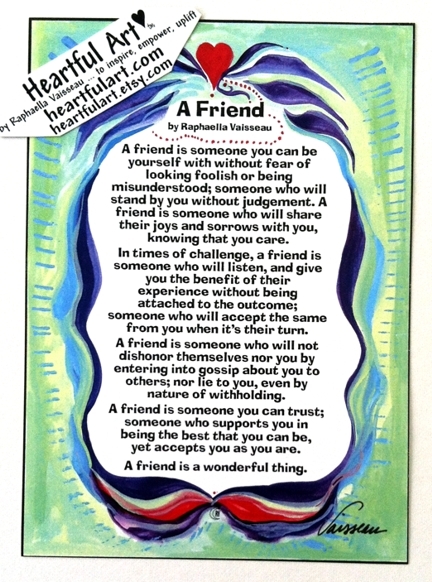 A FRIEND poster or print of Raphaella Vaisseau's original poem of friendship. Raphaella's thoughtful words speak for themselves about the essence of being a friend. This poem was the result of pondering the question, "What does being a friend mean to me?" Throughout the years of building and maintaining friendships, and aligning with the spirit of these words, friends can know the true meaning of, and have the experience of being there for each other. Be a friend. Stay true to yourselves while caring for each other. Enjoy and cherish friendship.